With the official announcement of the T-Mobile G-Slate already taken care of, now comes the official T-Mobile sign up page for information as it becomes available. 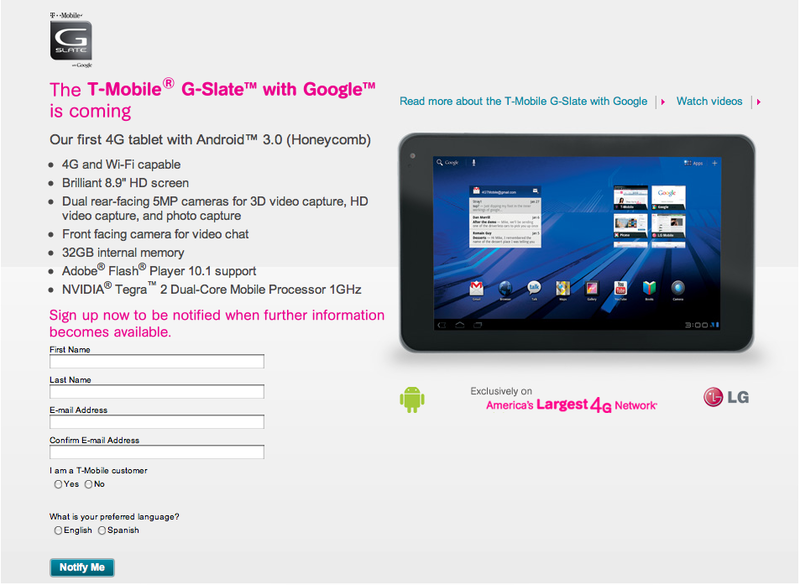 Another quick glance at the specs the T-Mobile G-Slate will have at launch just excites me all over again. So feel free to sign up and receive “official” updates but we’ll do our best to keep you informed just as fast as we can get info! Definitely going to sign up for this. This tablet looks so sick! I will be getting this, hands down, as soon as employee’s can order it! it is sick.. minus the size of the screen… but Im curious about one thing.. what is the true point of the 3d capture if the screen itself is not 3d? Tmonews.. tell me why you would show this but no link? Whats the point? full price is…. probably $700 like the xoom but given tmobiles relatively good prices on full prices, it could be 600. Exactly what I planned on doin. Once I cancel my Tab data plan in 4mos (my little sister asked me to keep the plan for 6mos. so she doesn’t lose commission) I’m gon sell the tab for a few buck then buy this. damn this is gonna be so expensive lol but im gonna get it anyway!! I’ll deffinately sign up depending on the price I might get it I don’t see me upgrading to a new phone this year my G2 does everything I need. I cannot wait to get one of these. Does any one know if this will have vanilla-comb or will it have an LG skin? I still want the iphone!!!!! no link to the page? Warning, warning! Niche item. Buy at your own risk! It just shows you the grand evolution of things. The smaller cell phones got the more expensive they got. Now, they are going in the opposite direction and companies are making giant phones. That is all a tablet is kids. Oh, wait, it can’t even make phone calls, lmao! Some people will just buy anything! I’m a long time Android smartphone supporter and i’ll be picking one of these up…..Tablets aren’t niche items…They’re the future. I’m growing tired of smartphones…They’re all the same…I mean how much different is a HTC Thunderbolt from a HTC EVO 4G? Honeycomb is the big draw with the G-Slate…not to mention it’s 3D/HD capabilities & bigger screen. Granted Tablets aren’t practical for calls (that’s why none of them can makes calls), but they are practical for everything else….web, media etc. Never heard more true words to describe an Apple fanboy. Sign up for info on an upcoming product? Like how I signed up, repeatedly, for G2 info and NEVER got any updates. I found all my info here or just by searching google. Tmo fails on their “update” pages. To be on the network, it will need a SIM card. SDCard/External memory slot? Cant find it on any of the spec sheets. It’s a Google stamped device which means it will get it’s updates on time! NICE!!!!!! Samsung and Motorola seem to hire developers from the bottom of the barrel and cannot seem to make their software shipdate! If it’s not stamped with Google don’t waste your time! Since this device appears to be Google branded I will buy it! This looks alot like the specs on the upcoming iPad 2.